Busking, or performing on the streets, is a great way to find out if you have what it takes to draw a crowd. Though it might be a perfect testing ground for your songs, stage presence, and endurance, buskers can also run into problems with bureaucrats and law enforcement if they lack the right permits, or don’t know the rules. Here are some guidelines to help you busk in New York City. Unlike Boston, no permit is required to perform music in the subway stations under New York City. 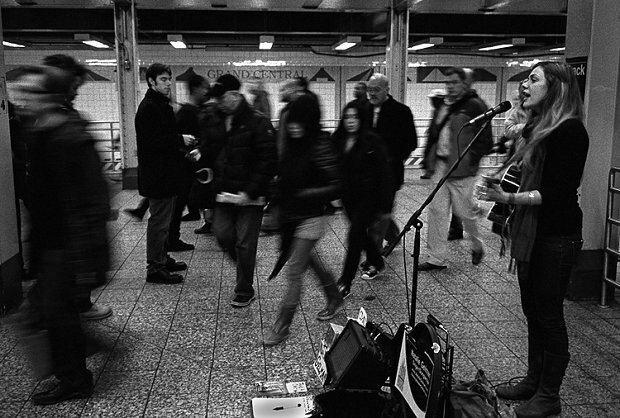 Although musicians aren't allowed on trains, acoustic performances are legal on subway platforms, and amplification can be used for performances in subway mezzanines. Despite the absence of underground permits, there's a history of friction between performers and transit authority police. To avoid conflict, many subway performers opt to audition for Music Under New York (MUNY), an official program of the Metropolitan Transportation Authority (MTA) that sets up clear schedules of performances and locations for MUNY members. MUNY performers are given special treatment underground in the form of high-traffic spots on subway mezzanines and commuter terminals, customized MUNY banners to display during their performances, guaranteed time slots, and invitations to perform at special events. If you would like to become a MUNY performer, you'll need to submit an application and pass an audition. Anyone who passes the audition becomes a lifetime MUNY member. To apply, submit your application along with a sample performance recording on a CD or DVD, and optional items such as your bio, resume, press clippings, reviews, etc. Applications are available on the MUNY website January through March, and are due by mid-March. If you pass the initial selection process, you'll be invited to a live, five-minute audition to decide if you're membership material. Don’t block anything, including walkways, stairs, elevators, escalators, fire extinguishers, or doors. Use amps only in the mezzanines, not on the subway platforms. Make sure people can hear the loudspeaker announcements. Keep it under 85 dBA. Monitor your levels using a decibel-reading app positioned five feet away from the sound source. Stay 25 feet away from booths, 50 feet from offices, and never near areas under construction. No CD or merch sales. Accepting donations is okay, but if people donate to get a CD, you’re pushing your luck. The fines for violating the MTA rules can be steep. Read the MTA Rules of Conduct for detailed information. Despite tension between performers and police – and some very public legal battles about street performance as a First Amendment right – performing on the streets of New York is legal according to the official website of the City of New York. NYC focuses heavily on permits (you even need a permit to play tennis in the parks), and it can be easy to get caught unaware by law enforcement. No performances between 8:00 p.m. and 9:00 a.m. if you're within 50 feet of a residential building; 10:00 p.m. and 9:00 a.m. everywhere else. Stay at least 500 feet away from schools, courthouses, churches, and hospitals during operating hours. You need a permit to use an amp. The cost is $45 per day. Apply for a Sound Device Permit at your local precinct. Apply for a Parks Special Event Permit to perform within earshot of a park. Applications must be filed at least three weeks in advance of your desired date, and cost $25 for up to a month of performances. To perform at the Staten Island Ferry Terminal, apply for a Ferry Terminal Performance Permit online. Where can you perform in the parks? In addition to requiring a Special Event permit in order to play music, some NYC parks also have contentious rules requiring performers who accept donations to perform in specific locations. These performance spots are marked by a medallion set into the ground, and performers must set up directly behind the medallions. Union Square, Battery Park, the High Line, and certain portions of Central Park have all installed a limited number of medallions throughout the parks. Maps of the approved performance locations in these parks are available online in the city’s FAQ sheet for performers. In all parks, performers are also asked to keep off of the “furniture,” so avoid tables and benches. Bring your own chair if you need one! New York has a history of making busking difficult and even illegal: Between 1936 and 1970, performing in the streets was banned in NYC. Compared to the last century, things are much easier for buskers now. Many performers, however, can tell stories of run-ins between buskers and police. Knowing the basic permitting and conduct guidelines should make your own performances smoother.